When at Princples Agency, we launched Motors.co.uk to the motor trade as a highly effective driver of new enquiries and sales. We devised a press campaign that clearly explained all the benefits and positioned motors.co.uk as an easy and cost-effective solution. Take the wheel and shift enquiries up a gear. 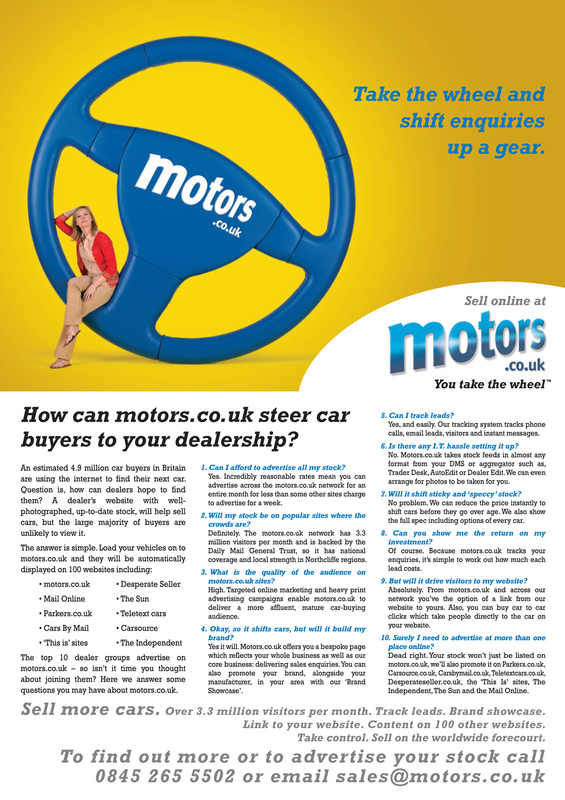 How can motors.co.uk steer car buyers to your dealership? An estimated 4.9 million car buyers in Britain are using the internet to find their next car. Question is, how can dealers hope to find them? A dealer’s website with well-photographed, up-to-date stock, will help sell cars, but the large majority of buyers are unlikely to view it. The top 10 dealer groups advertise on motors.co.uk – so it isn’t it time you thought about joining them? Motors.co.uk history checks all cars listed too so customers have 100% confidence in dealing with and buying from you. Pound for pound, we doubt you’ll find anyone who drives more enquiries to you than motors.co.uk. Sell more cars. Over 3.8 million visitors per month. Track leads. Brand showcase. Link to your website. Content on 100 other websites. Take control. Sell on the worldwide forecourt.